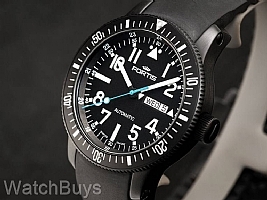 Drawing inspiration from both the Fortis Cosmonautis Collection, as well as the first Fortis Dive watches which date back to the 1940's, the new Aquatis Diver Black demands your attention. White hands, numerals, and indices seemingly jump off of the jet black dial. The blued "Bull's-eye" second hand is also a standout feature of this new watch. An easy grip, coin edged uni-directional black steel bezel is so well designed, it almost looks like an extension of the dial itself. Screwed lugs ensure that the watch is secure on the wrist at all times. As an added benefit, this watch also features a day/date display at the 3 position with the day display in either English or German (you change the settings through the crown). 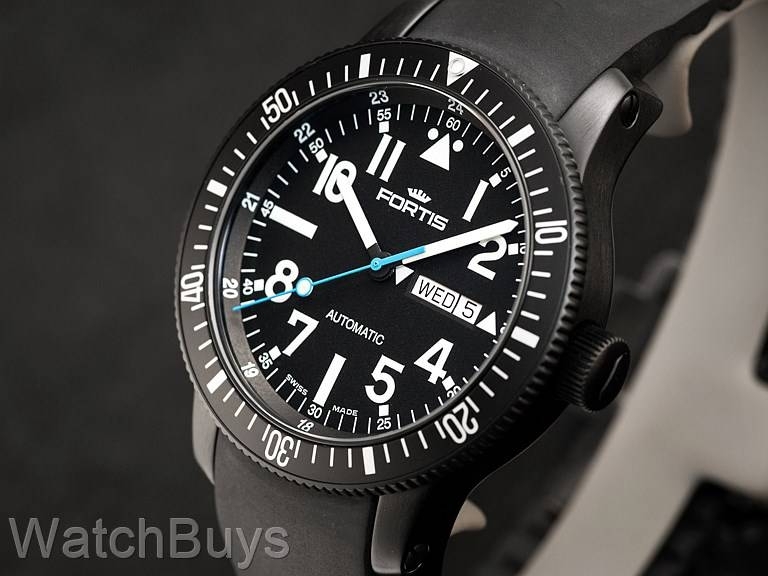 At 42 millimeters, in an all-black PVD steel case, the Fortis Aquatis Diver Black is an excellent option for the majority of wrist sizes. A compact, butterfly style deployant buckle attaches to a black silicone rubber strap, making it very easy to wear or remove the watch with one hand. This watch is fitted with a black rubber strap. Verified Owner Comments: And another year (ish). Still a fantastic watch, no issues at all. Crystal perfectly clear, keeps date and time very, very well. Maybe a minute off every six months or so. Verified Owner Comments: Still own the watch. Wear every day in a hot, sandy and humid environment. No signs from new except moderate wear on clasp. So far, 100% happy with purchase. Does what I need, dependably, and looks nice. Amazed how well it is holding up with more than moderate use. I destroyed an Omega Seamaster. Happier with this one. Verified Owner Comments: Quick answers, educated Customer Service. Great Company. Watch: Great looking. Came in a GREAT box, high end for sure. Overall seems fantastic for purpose - Would give it five of five, except crown doesn't lock tight, spins. Assured by CS that this doesn't matter for water-tightness. If they are right, no worries. If my 1k dollar watch lets in water, worries. But, so far, would buy again, and would definitely use watchbuys again. FAST shipping, fantastic responses to emails (usually in an hour or less) and all around great info.